Vancouver, British Columbia--(Newsfile Corp. - August 29, 2018) - Sixty North Gold Mining Ltd. (CSE: SXTY) (FSE: 2F4) (OTCQB: SXNTF) (the "Company" or "Sixty North Gold") is pleased to announce that it has received assay results from 282 rock samples collected across its Mon Property, Yellowknife Gold Belt, NWT, Canada. The two established gold trends have been further defined from this work. In addition, 155 biogeochemical samples have been collected and analyzed. Further results are pending. One hundred and two rock grab and chip samples were collected from the West Mafic Trend (WMT). The highest assay of 52.4 gpt gold (fire assay 30gm gravimetric finish) with the average grade of 2.67 gpt is within the 3,300m long trend across the property. Twenty-two of the samples include continuous chip samples where exposures would permit. The historic WXY Zone within the WMT returned 7.22 gpt gold over 6.0 m in Trench #4 with only minor quartz observed. Trench #5 located 30m on strike from trench #4 returned 2.18 gpt gold over 5.4m. Exposure limits further sampling in this area. All mineralization is structurally controlled, occurring in discrete schistose domains +/- quartz, cross-cutting mafic to intermediate volcanic rocks intruded by gabbro. Readers are cautioned that grab samples are by their nature selective and are not necessarily indicative of the general geology of the property. 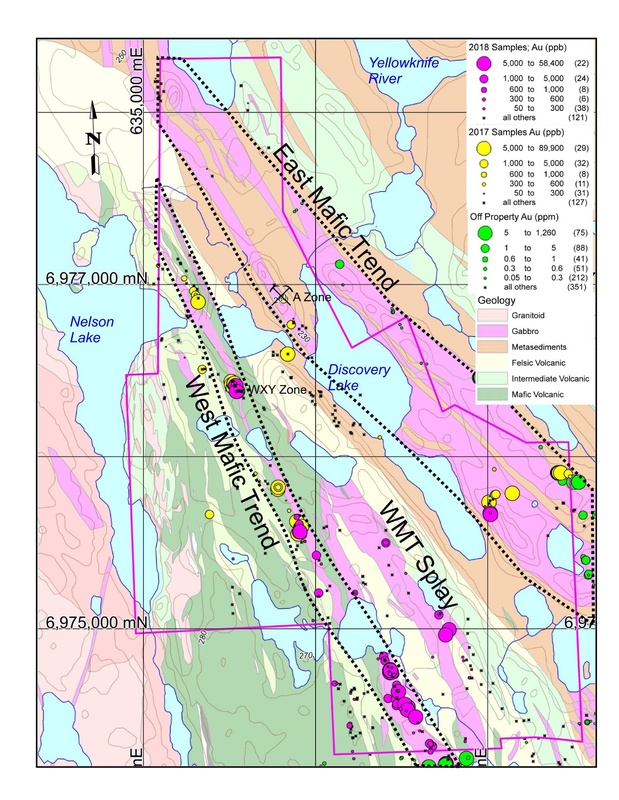 Forty-seven samples focused on a 450m-long, well-mineralized portion of the WMT 1,800m south of the WXY Zone. Grab samples of rocks hosting structurally controlled quartz and sulfide-rich schist zones up to 70 m wide (50% schists) contain the high value of 52.4 gpt and an average of 4.64 gpt gold. In addition, a 1,500m-long splay of the WMT was tested by 39 rock grab and chip sampling contained a high assay of 45.5 gpt gold (fire assay 30gm gravimetric finish) (58.32 gpt gold by ICP) and an average grade of 2.12 gpt gold. The highest values occur proximal to a 57m wide zone of structurally controlled quartz veins cross-cutting intermediate to felsic volcanic rocks tested by a 7m long historic trench. The East Mafic Trend (EMT) can be traced for 3,700m across the property, includes the past-producing A-Zone and has been tested in another location by another five samples. These average 11.96 gpt gold with a high value of 37.5 gpt (fire assay 30gm gravimetric finish). All rock grab and chip samples were collected by hand and were located by hand-held GPS, bagged and tagged with certified blanks and standards inserted at 1 in 7 to 1 in 10 intervals, sealed, delivered to Bureau Veritas Laboratories in Yellowknife and processed at their ISO/IEC 17025:2005 and ISO 9001:2015 certified laboratory in Vancouver. Bureau Veritas is independent of the Company. All samples were crushed and pulverized using PRP 70-250, analyzed for 53 elements by ICP-MS using AQ251 and fire assay gold FAA 330 with all over limit golds analyzed using fire assay gold FAA 550. The laboratory also runs duplicate and repeat analyses of every 15th to 25th sample, as well as internal blanks and standards which are reported to the Company. The first spruce bark (SB) sample program on the Mon Property has confirmed and extended the known trends and identified additional target areas as shown on the attached map. The EMT can be shown to host the only five biogeochemical samples with anomalous gold values (out of 155 samples), including the most anomalous sample, which is coincident with the high-grade past producing A-Zone. Materially, this defines and extends the favourable trend for over 1,800m towards the high-grade gold values sampled rocks in the EMT. It is significant that there is no bedrock exposure except at the A-Zone and at the south-end of the anomaly. Follow-up work is recommended. There is an extensive (3,700m long) biogeochemical anomaly dominated by copper, zinc, and silver with minor antimony and mercury that broadly coincides with the top of a thick, felsic tuff in contact with metasedimentary rocks. This is consistent with what would be expected within a volcanogenic massive sulphide (VMS) environment. There is a well-defined western biogeochemical anomaly dominated by mercury and antimony with minor copper arsenic and silver. Some gold showings with values up to 4.49 gpt occur in quartz with chalcopyrite and malachite cross-cutting mafic volcanic rocks. Follow-up work is recommended. Ronald Handford, CEO of Sixty North Gold, reports, "The follow-up rock sampling has identified areas that should be examined in more detail. The WMT sampling demonstrates both size and grade potential in rocks similar to those that host the gold deposits in Yellowknife (past production: 14 million ounces of gold). Additional sample results are pending, but the Company will immediately follow-up these exceptional results with a trenching program to collect representative samples across a number of these prospective zones." "The biogeochemical program identified portions of the EMT where spruce trees have similar biogeochemical characteristics as those at the past-producing A-Zone. This extends the prospective A-Zone horizon for over 1,800m through areas that have very limited or no bedrock exposure. Follow-up work on this anomaly will be conducted." "The VMS horizon will be examined in more detail in the future. 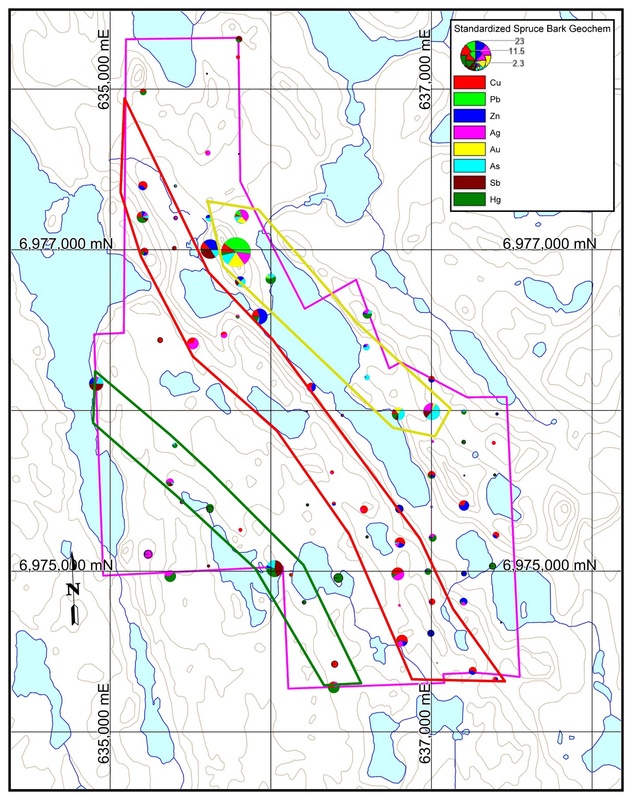 The Sunrise Lake VMS deposit located 130km east-northeast of Yellowknife, owned by Silver Standard Resources Inc. reported a Mineral Resource Estimate of 1.5 million tonnes of Indicated Mineral Resource grading 2.39% lead, 5.99% zinc, 0.08% copper, 262 gpt silver and 0.67 gpt gold and 2.6 million tonnes of Inferred Mineral Resource grading 1.92% lead, 4.42% zinc, 0.07% copper, 169 gpt silver and 0.51 gpt gold (Roscoe, W.E., and Wallis, C.S., 2003), open for expansion. The VMS horizon is a viable target on the Mon Property." Readers are cautioned that mineralization hosted on the Sunrise Lake VMS deposit is not necessarily representative of the mineralization hosted on the Mon Property. Mr. Handford further reports, "Crews have been on the property since June assessing all historic showings and identifying new zones. Additional sample results are being received and will be released upon completion and confirmation by our QP." The Company is engaged in acquisition, exploration and development of mineral properties. Its principal target is the exploration for gold on the Mon Gold Property, 40km north of Yellowknife, NWT. The Mon Gold Property consists of 11 contiguous mining leases and 3 mineral claims, comprising an aggregate 1,536.92 acres, located in the South MacKenzie Mining District, NWT. For more information, please refer to the Company's Prospectus dated January 19, 2018 available on SEDAR (www.sedar.com), under the Company's profile. Statements about the Company's future expectations and all other statements in this press release other than historical facts are "forward looking statements". Such forward-looking statements are based on numerous assumptions, and involve known and unknown risks, uncertainties and other factors, including risks inherent in mineral exploration and development, which may cause the actual results, performance, or achievements of the Company to be materially different from any projected future results, performance, or achievements expressed or implied by such forward-looking statements. Further details about the risks applicable to the Company are contained in the Company's Prospectus dated January 19, 2018, available on SEDAR (www.sedar.com), under the Company's profile.